Owing to increase significance of study of subseafloor life, KCC has begun curation of deep frozen core samples for geomicrobiological research. 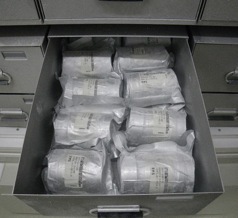 These core samples are called "Routine Microbiological Sample (RMS)" in IODP. In order to introduce RMS and facilitate selection of appropriate RMS by researchers, RMS related details have been uploaded in the KCC website (http://www.kochi-core.jp/rms). Researchers can use combinations of keywords such as sampling site and depth to find RMS suitable for their research interest. Detailed information about the IODP expeditions that sampled RMSs can be accessed through the links provided in the site.